1. Vitamin A is a recommded treatment for this condition -T or F? 2. The responsible genetic mutation for this disease process involves peripherin. 5. Transport gene mutation is responsible for the FA findings -T or F.
1. Vitamin A has actually been found to be detrimental in this condition.2. 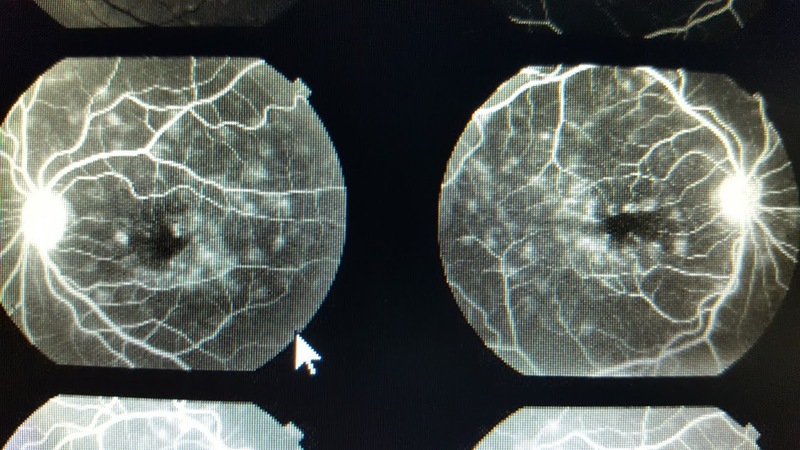 The genetic mutation most commonly associated with the disease in this case is ABCA4.Peripherin mutations can be found in this condition but are more commonly associated RP, cone-rod dystrophy, and vitelliform macular dystrophy. 3. EOG can be normal in early stages.4. False.5. True. Dr A- This is a case of Starboards disease. Note the discrete, yellowish, round or pisciform flecks at the level of RPE that is very typical of the Juvenile onset foveal atrophy. Stargards disease is the most common form of juvenile macular dystrophyThis is most commonly caused by mutations in ABCA4 gene which encodes the ATP=binding cassette(ABC) transporter protein expressed by rod outer segment and passed as Autosomal dominant.Less common – mutations in genes STGD4 and ELOVL4 and RDS/peripherin gene.Silent choroid on FA –Specific for Stargards - Secondary to masking of choroidal fluorescence by lipofuscinlike pigment accumulation through out RPE. Clinical triad of macular atrophy, flecks and silent choroid is necessary for on to make the diagnosis of Stargards.Note that the Flecks represent RPE cells engorged with abnormal lipofuscinlike materiel. There is specific treatment other than low vision aids. Vit A should be avoided as it can increase lipfuiscinlike accumulation. 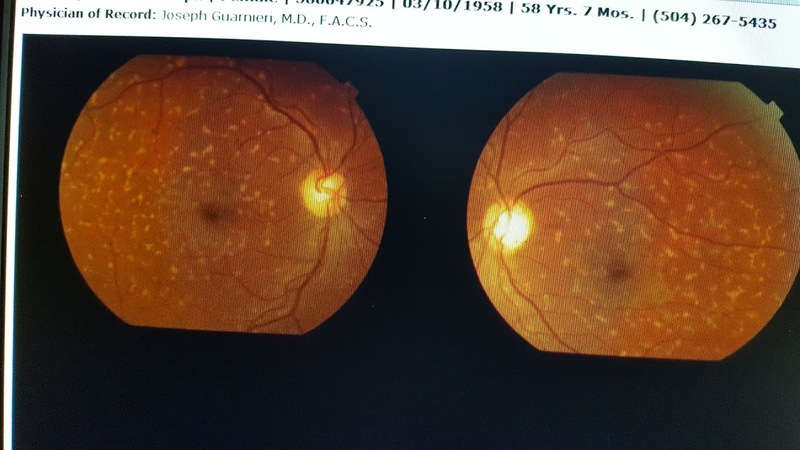 EOG is always Abnormal in Best disease, even in asymptomatic patients with normal fundus and not stargards.Familial Dominant Drusen may be associated withhereditary renal disorders that involve basement membrane abnormailities such as Alport syndrome and membranoproliferative glomerulonephritis type 2.